My son's name is Archie and my baby boy has a blue and green baby nursery room that at first glance may seem to have a very modern design. If you will take a moment and look a little further you may be amazed at the many quaint, vintage touches that I have hung on the walls and in other spots to add depth and a sense of the not so very distant past. We considered many different shades of green and blue for Archie's nursery. The paint colors that we chose were the ones that we felt worked best with the style of the decorations that I planned to make myself. The white crib, the changing table and the little table that holds the storage bins all have a very contemporary look that is efficient and easy to maintain. However, the nursery walls are where the eclectic mix of vintage and modern styles really comes into play. 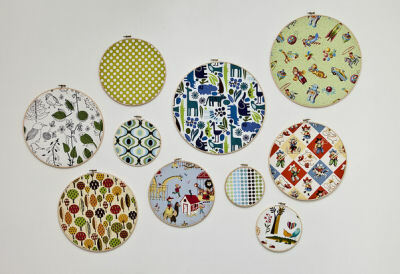 The arrangement over the baby bed features ten (10) wooden embroidery hoops that I filled with various fabrics, some vintage and some with modern motifs that all had blue and green somewhere in the print. 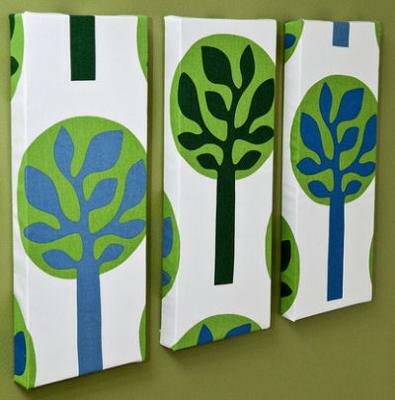 The jungle animal fabric coordinates with the three tree canvases that I made using Ikea fabric on the olive green accent wall. I made the arrangement on the wall opposite the baby's crib by taking pages from a Little Golden Book called "The Little Golden ABC". I removed pages that I needed to spell out Archie's name. Michelle, our visitors love your nursery pictures! Every aspect of your baby boy's green and blue nursery is adorable but what really stands out to me is that you have a talent for not only choosing coordinating patterns and prints but for blending modern and vintage decorations. Thanks so much for sharing your blue and green nursery ideas with visitors to Unique Baby Gear Ideas and best wishes to you and your baby boy! Really amazing! I like your craft ideas with the vintage fabrics and the way you combined the modern and old-fashioned decorations. I love the cute, vintage alphabet pictures! What a super idea! I thought it was cute even before I noticed that the letters spelled out the baby's name! I'm not looking for blue and green nursery ideas, but I am saving these ideas for nursery decorations. Join in and write your own page! It's easy to do. How? 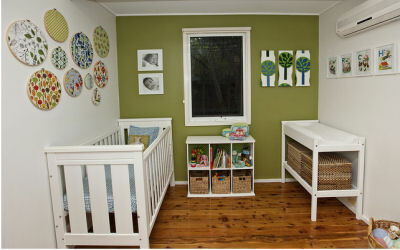 Simply click here to return to GREEN NURSERY PICTURES and DECORATING IDEAS.